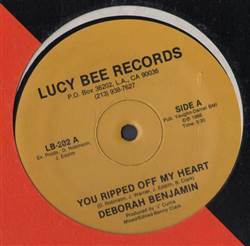 FUNK/SOUL, Lucy Bee, USA, 1988... You Ripped Off My Heart, You Ripped Off My Heart (Extended), You Ripped Off My Heart (Short Version). Octavia - 2 The Limit 12" Jerry Butler - You Can Fly / Where Are You Going 45 J.T. Watkins - Love To See You Smile 45 Adrian Younge Vs Adrian Quesada - Adrian Younge Vs Adrian Quesada 12"